Unusual 19th century brass mounted neoclassical console table in Karelian birch. Russia, circa 1820. Good condition, wear consistent with age and use. Fine and rare 19th century Empire giltwood demi-lune console table with Carrera marble top. Sweden, Stockholm, circa 1830. Very good condition with wear consistent with age and use. Fine early 19th century Gustavian console table in original color with Carrara marble top, circa 1800, Sweden. Fine 19th century Empire demilune console table, finely decorated with led flowers with Carrara marble top, circa 1820, Sweden. Elegant Empire console table, France 19th century, mahogany veneer with original fittings and cream colored marble top. 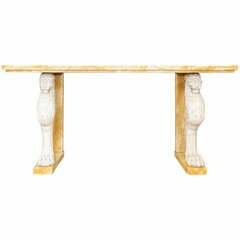 Impressive large Italian sienna marble & composition stone console table on lion monopodia supports. Great pair of 19th century French neoclassical parcel-gilt consoles with original marble tops.